Hungary plans to break ground next year on its stretch of the South Stream pipeline to send natural gas from Russia to Europe. It is in defiance of EU and US calls to halt the project over frosty relations with Moscow. One major reason Hungary has thrown its support into South Stream is the lack of a better option since the EU-backed Nabucco pipeline, which was supposed to deliver gas from Azerbaijan to Europe, failed. “Nabucco will not be built and after nearly 10 years of hesitation, and especially in light of the Ukraine situation, we need to act. This is a necessity,” Hungarian Energy Minister Andras Aradszki told Reuters. Earlier Hungarian Prime Minister Viktor Orban said that Washington is putting pressure on Budapest for cooperating with Russia over energy. Gazprom’s $45 billion South Stream project will deliver about 64 billion cubic meters of gas to Europe, Russia’s biggest client, without unreliable passage through Ukraine. Russia is Hungary’s biggest source of natural gas, and in 2013 the country bought 6 billion cubic meters. Hungary hopes the pipeline will be complete by 2017. Ministers from Russia also confirmed construction will begin in 2015. “Today the sides confirmed all their commitments signed under the South Stream project,” Russian Foreign Minister Sergey Lavrov said Wednesday after talks with his Hungarian counterpart Peter Szijjarto. Hungary, along with Slovenia, Bulgaria, and Austria, still support the project despite EU attempts to stall it due to the political rift with Moscow, said Energy Minister Aradszki. Proponents inside the EU argue the project is critical for EU energy security as it will provide a direct and reliable pipeline to Russia. Opponents argue that it is a step backwards for EU energy independence, as it deepens reliance on neighboring Russia. On November 4, the Hungarian parliament approved the construction of the South Stream pipeline without European Union agreement. 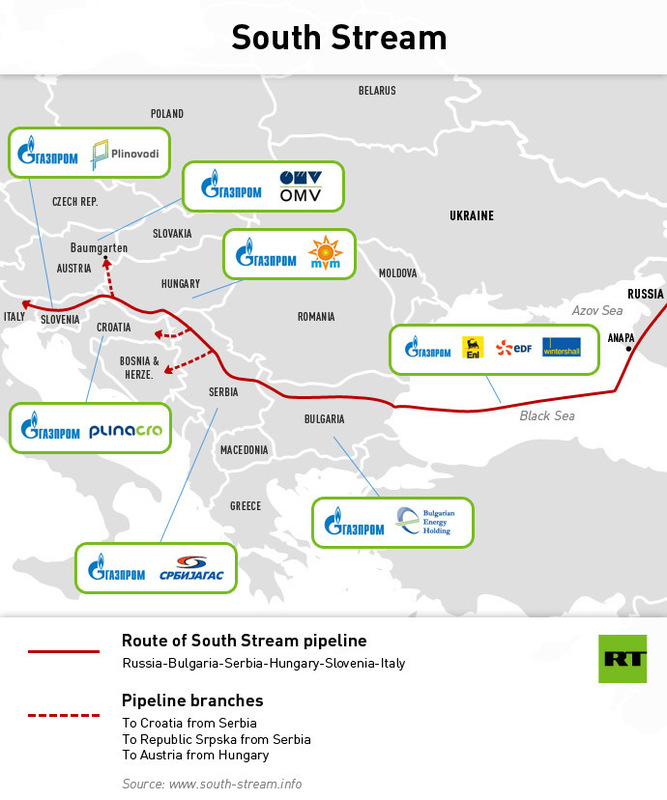 The EU says South Stream will violate its Third Energy Package, which doesn’t allow one single company to both produce and transport oil and gas. In September Hungary indefinitely halted gas shipments to Ukraine after securing a new deal with Russian gas major Gazprom, which the West saw as a move towards Russia’s orbit. In 2013, Russia sold 162.7 billion cubic meters of gas to Europe and expects to sell at least 155 billion cubic meters this year. folks, this is going to be the next “Mistral” project . . .